1. In which step the elements ‘56 such 18’ found in the same order? 2. In step IV, which of the following words would be at 3rd position to the left of 5th from the right end? 3. How many step required completing the above arrangement? 4. Which of the following would be the step III after arrangement? 5. In step VI, ‘such’ is related to ‘55’ and ‘risk’ is related to ‘31’. In the same way ‘put’ is related to? Directions (6 – 10): In each of the questions below are given four statements followed by four conclusions numbered I, II, III and IV. You have to take given statements to be true even if they seem to be at variance from commonly known facts. Read all the conclusions and then decide which of the given conclusions logically follows from the given statements disregarding commonly known facts. 6. Statements: All coins are notes. Some notes are rupee. No rupee is money. Some money are table. I. Some table are notes. III. No table is notes. IV. Some rupee are coins. 7. Statements: All cat are horse. All horse are tiger. Some tiger are lion. Some lion are monkey. I. Some tiger are horse. II. Some monkey are horse. III. Some lion are horse. IV. Some cat are lion. 8. Statements: Some cat are dog. All dog are pig. 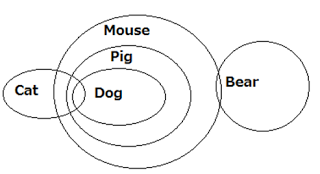 All pig are mouse. Some mouse are bear. I. Some bear are dog. II. Some mouse are cat. III. No bear is dog. IV. Some mouse are dog. 9. Statements: Some star are light. Some sky are light. All light are bulb. 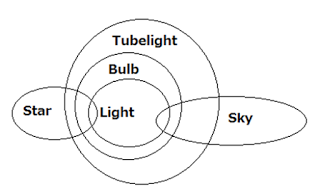 All bulb are tubelight. I. Some tubelight are star. II. Some tubelight are sky. III. Some sky are star. IV. Some bulb are star. I. Some road are box. II. Some jungle are wall. III. Some house are box. IV. Some road are house.